I managed to squeeze in a couple of hours out on patch this afternoon between work, window fitters and heavy rain showers that featured nowhere in the forecast. My aim was to try and find a couple of new species for the Patchwork Challenge as let's face it, one visit during the whole of January is not going to win me any prizes (Competitive? Me?). A flyover Sparrowhawk made for an encouraging start as they are an annual sighting here at best. The presence of so many small birds suggest that at least one individual is probably resident, but if so it certainly does a good job of hiding away. Sharing its airspace were the usual Raven pair and at least one Red Kite, plus the first of what was to be my largest ever count of Mistle Thrushes on patch. A further flock of twelve and one pair made for a very pleasing fifteen birds in total. All of the above were seen from the valley floor whereas my main focus for the day was to be Cefn Drum. This hulking mass makes up the wilder and considerably hillier northern side of my chosen study area, a place that can be a bit barren at the best of times. Today was no different with a cold wind hardly encouraging a lengthy stay. However, being the good birder that I am I kept at it and was ultimately rewarded with three silent Skylarks scurrying for cover. Pushing further north revealed nothing else so instead I dropped back down to the river for a spot of Dipper hunting. As with my previous search I drew a blank but did manage to disturb a bird whose identity initially baffled me. Watching its rear retreat down the valley and into heavy undergrowth is never the best for identification purposes, but my first instinct was to go for a Snipe or Woodcock. The lack of a long beak was the only flaw in that plan though the side to side flight and squarish wings weren't a million miles away. Colour wise it was predominantly brown with a very red tail and a walk that was much like that of a Partridge. Could it really be? A quick look at the reference books confirmed that somehow I'd managed to relocate one of the Grey Partridge's from last year. 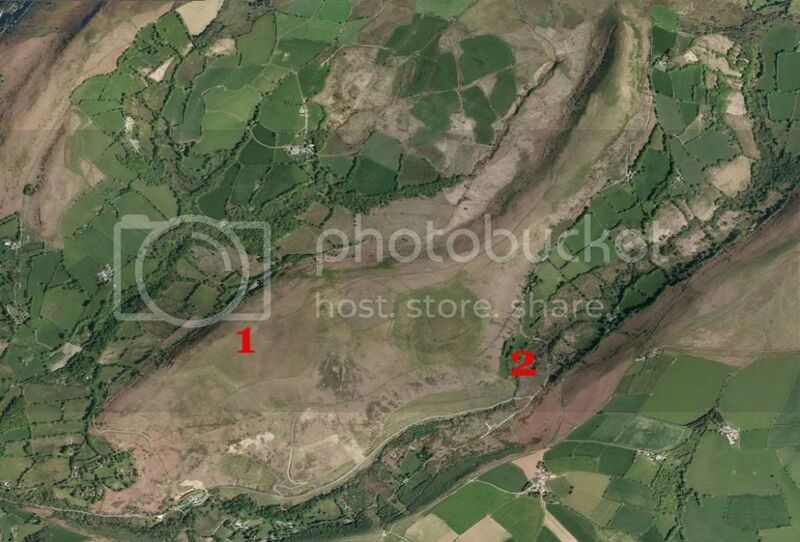 The map above shows Cefn Drum in its entirety with the the number '1' indicating the rough locality in which I saw Grey Partridge last year. The number '2' shows today's sighting so I think it's highly likely that this was one of the same birds. As I've mentioned before I can't verify the origin of these birds but with such a small population now clinging on in Wales it would be brilliant if they were able to survive. Rounding off the day were a pair of Jays, two Goldfinches and at least ten Meadow Pipits. That takes me up to 36 species and 37 points. Very nice. I'll say it is great! Good that found the Grey Partridge again---A good count for your Squeeze in Visit! Adam, we saw 3 Woodcock at dusk two nights ago at 5 roads and about two weeks ago there was a Yellowhammer singing for almost hour at Corrie Dam, plus there have been 4-5 at Sandra's aunties feeding station in the cwm all winter so you should connect eventually.